Frank and Pauly’s opened its first restaurant in 1993 on Public Square in the BP Building. I remember eating there and being impressed by the food. We ordered several family style entrees that night, and I remember going back to my room at the Ritz Carlton a very happy translator. The restaurant closed shortly after that. It reopened briefly in Independence, and I ate there once with the executive board of my local translators group. Frank and Pauly’s is now open in Mentor at The Sawyer House, which is on the National Register of Historic places as one of the only Stone Homes in Lake County. Owner Dennis Koury is using his brother Wayne Koury’s (founder of Frank and Pauly’s) recipes. They take care to use fresh ingredients and import quality pasta and cheese from Italy. When I heard the news that Frank and Pauly’s was now in Mentor I knew this would be the perfect venue for my new dining out group and quickly scheduled a dinner. I apologize for the darkness of the photos, but I didn’t want to detract from the other diners’ enjoyment by turning on my flash. The Sawyer House is a gorgeous venue. 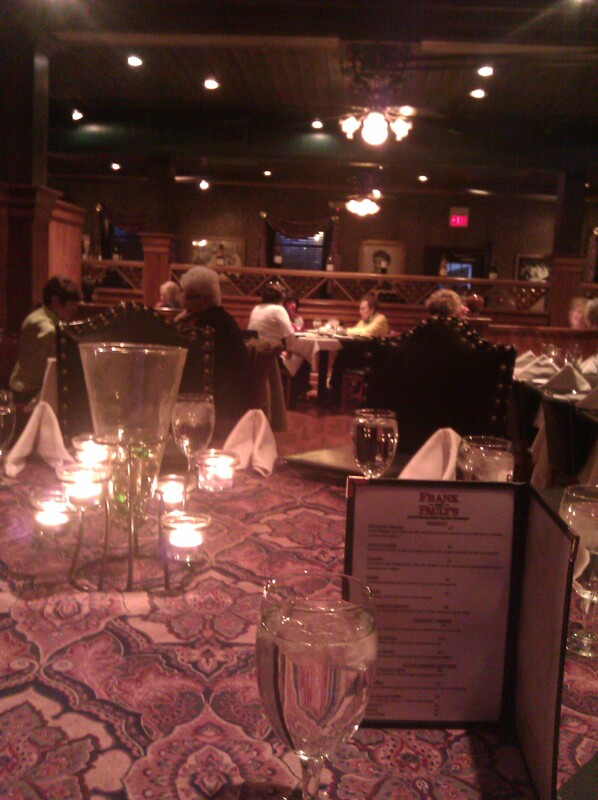 We were immediately blown away by the sumptuous woodwork and cozy dining room. We were seated at a round table, which pleased us to no end because it allowed us all to talk with everyone in the group. We started the evening off with cocktails. I am a sucker for dreamsicles, so when I saw the Orange Dreamsicle on the menu I was thrilled. It was a delicious cocktail. I then switched to red wine with dinner, but a cocktail was the perfect way to take the edge off the day. The group ordered several appetizers for the table to share. The bruschetta was delicious (unfortunately I wasn’t able to photograph it). The Roma tomatoes were plump and luscious, the crostini bread was soft and had a good bite to it, and the balsamic dressing was really delicious. I can’t wait to go back and order it again. 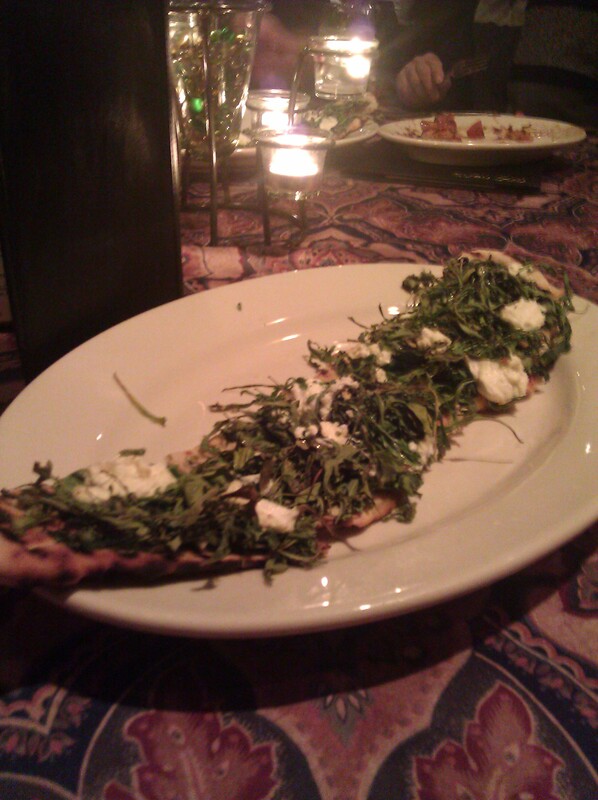 We also split several grilled flatbreads, featuring arugula, Ohio Creamery goat cheese, lemon, garlic and oil. The arugula was a bit dry for my taste (being grilled), but the goat cheese paired really well with the arugula and the lemon and garlic kicked it up a notch. We also ordered two family style salads to share. The Frank & Pauly’s salad with mixed greens, crispy prosciutto, crumbled gorgonzola and red onions did not disappoint. 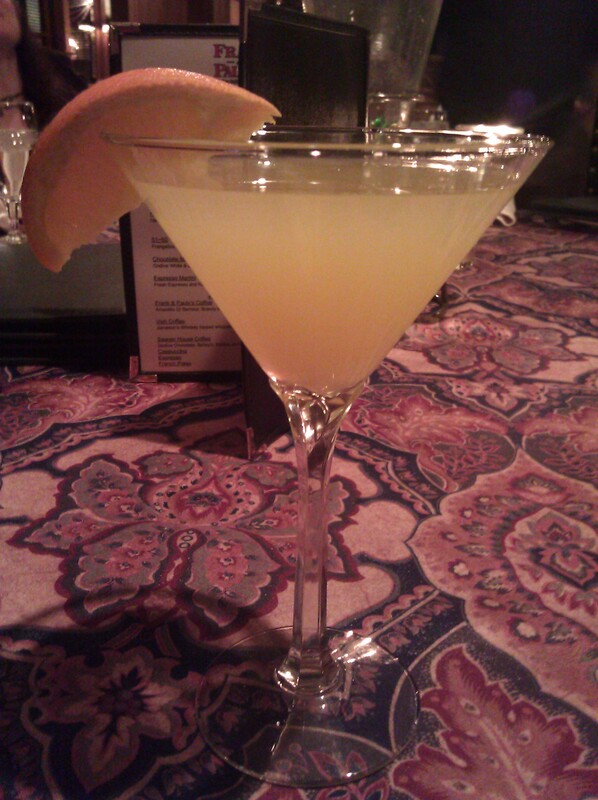 It was very flavorful and just as good as I remembered it. 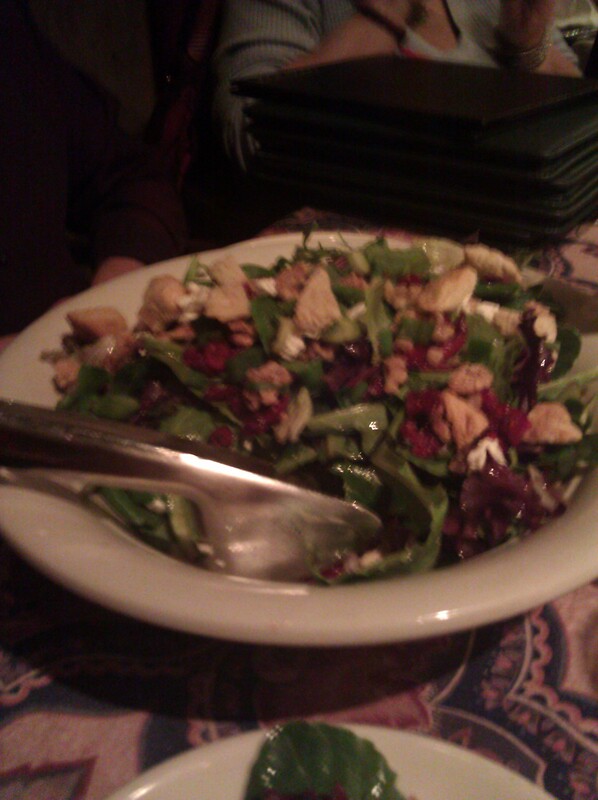 The second salad, the cranberry walnut salad, was my favorite of the two though. It featured mixed greens, dried cranberries, candied walnuts, croutons, green onions, and creamy goat cheese and was topped with a delicious raspberry vinaigrette. I ordered the spaghetti and meat sauce. 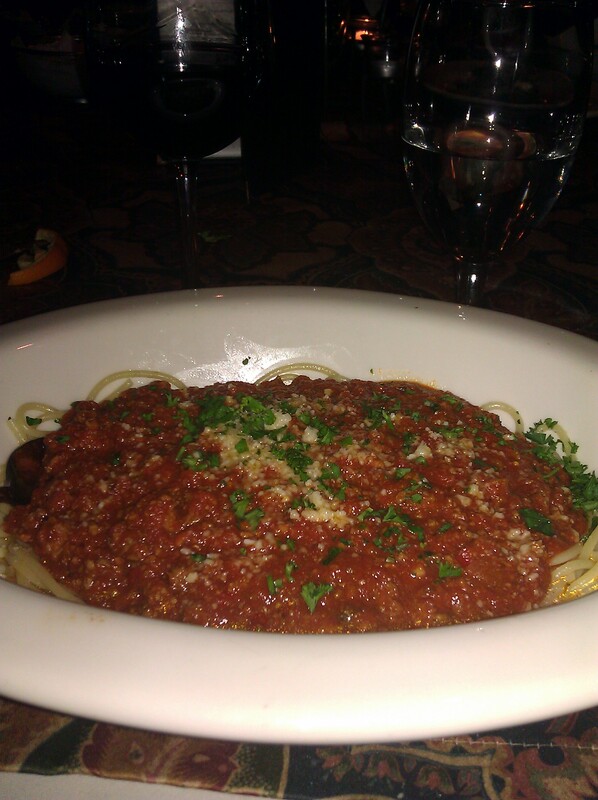 The pasta was al dente, and the meat sauce was very flavorful. I liked it, but I wasn’t thrilled with it. I love a good Bolognese, but I have very high standards. No meat sauce measures up to the Bolognese I had at a little hole-in-the-wall Italian place down in Cincinnati. It probably isn’t fair to compare, but that’s what diners do all the time. Don’t get me wrong, this was a very tasty meat sauce of fresh ground beef, veal, pork and is definitely worth ordering. That said, the addition of hunks of crispy prosciutto might kick this meat sauce up a notch. When I go back to Frank & Pauly’s I will definitely order the lasagna, because both people at our table adored their meal. Everyone else was very pleased with their entrees, from the fuscilli vegetable ricotta sauce, mostaccioli eggplant marinara, eggplant parmesan (R. ate the entire entree so it must have been good), veal piccata, and the stuffed shrimp scampi, which were the special that night. The service at Frank & Pauly’s was impeccable. Our waitress was very attentive and had no problems with separate checks for our table of ten. The timing of the food was perfect, and she even waited to put our entree orders in to allow one of our latecomers to eat with the group (we had just finished ordering when she arrived). Our water glasses were topped up several times, and everyone was very friendly. I can’t wait to go back to this little gem in Lake County. It is well worth the drive! Everyone at my table agreed.